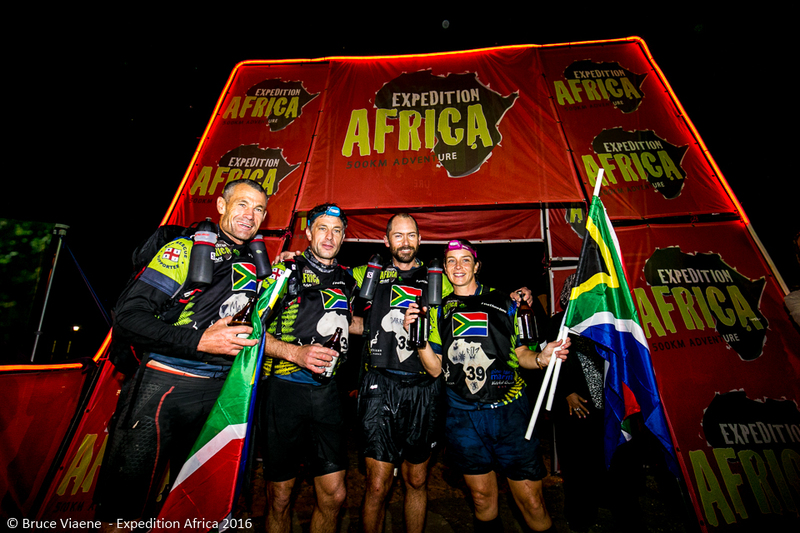 3 days, 12 hours and 33 minutes is how long it took for Expedition Africa 2016’s champions to complete 500km of pure adventure racing. Cheers from the side lines howled as team Featherbed Painted Wolf neared the spectator filled shoreline at Pine Lake Marina this evening. The local come back team drew massive support from all over the Garden Route throughout the race. “Some of the guys would pop out while we were paddling the Keurbooms, saying: I’m watching you live!” shares Mark Collins. 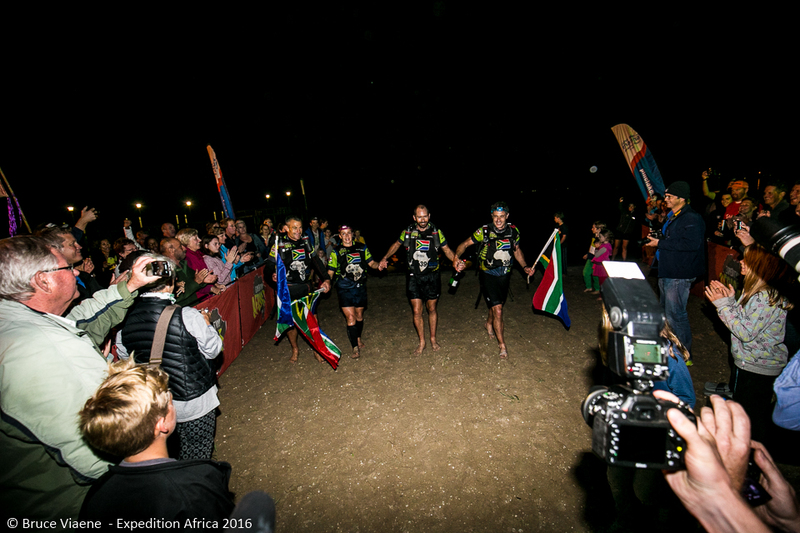 According to the athletes; the Expedition Africa live tracking made a major difference to the sport in South Africa. The Home of Adventure created the perfect playground for Stephan Muller’s masterpiece of a route. The local team confirmed that they have officially ventured through parts of the Garden Route they didn’t know existed. “That cave was spectacular! I had never seen that section of Robberg , and I would love to back into that cave; particularly to find out how the organisers expected us to come out of the coasteering leg, as we came up through the Robberg Quarry!” Mark Collins shares laughingly with a Mitchells beer in hand. Expedition Africa has become one of the most highly rated Adventure Races in the world.” The New Zealanders dominate the sport, but they have acknowledged Expedition Africa as one of the accredited event, and we have just won one of the best accredited events in the world” proudly shares Collins. As the team enjoyed their first meal (pizza), seated on leather couches at Pine Lake Marina, media asked questions and photographers flashed away. Giving this team the true feeling of champions as the Merrell Adventure Addicts race their way to the finish to claim second place. The Merrell Adventure Addicts are expected to cross the finish line around midnight on Wednesday, as teams Sweco Adventure, Raid Gallaecia Fridama and Cyanosis Adventure Racing compete for third, fouth and fifth place. Expedition Africa 2016 has proved to be an exciting and entertaining event for dot watchers, marshals and supporters here in the Garden Route. With over 50 teams to still cross the finish line at Pine Lake Marina by Friday this week the entertainment continues watching dots on a map, but more importantly watching adventurers racing a race of a lifetime. “We have never received such an amazing support system in an adventure race. We would like to ask the people of the Garden Route, South Africa and abroad to continue the support that is streaming in as the rest of our teams race their way ‘home'” shares Heidi Muller, co race director of Expedition Africa. Our Champions are home, but the teams who are still out in the wilderness are our heroes as they battle physical and mental drain with sleep monsters biting at their hills. This is Adventure Racing at its finest.